CSC MC 32, s. 2001: Reiteration of the Strict Implementation of Section 1, Rule IV and Section 3, Rule VI, both of Memorandum Circular No. 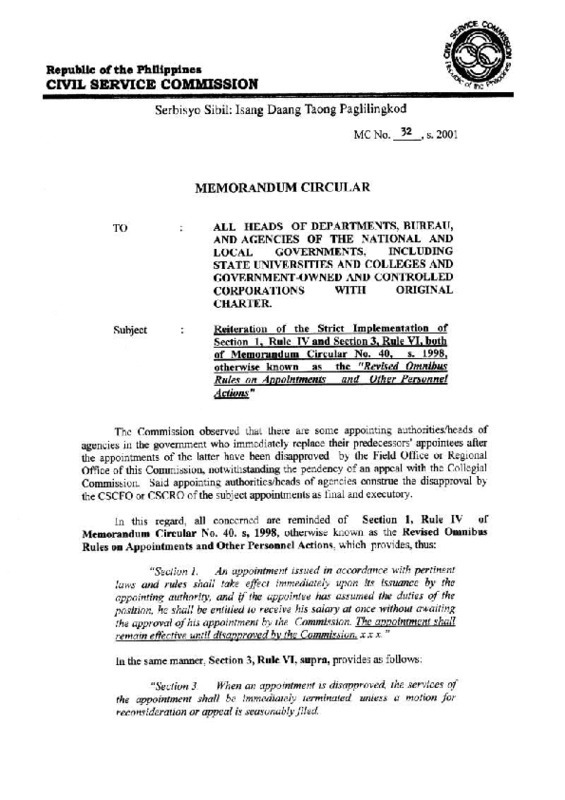 40, s. 1998, otherwise known as the "Revised Rules on Appointments and Other Personnel Actions"
“CSC MC 32, s. 2001: Reiteration of the Strict Implementation of Section 1, Rule IV and Section 3, Rule VI, both of Memorandum Circular No. 40, s. 1998, otherwise known as the "Revised Rules on Appointments and Other Personnel Actions",” CIVIL SERVICE GUIDE: A Compilation of Issuances on Philippine Civil Service, accessed April 26, 2019, http://csguide.org/items/show/467.